Bring all of the brine ingredients to the boil in a large saucepan until the sugar and salt dissolves completely, then allow to cool. Once cool, place the hock in a large non-metallic bowl or plastic box with lid (make sure its sterile) and pour over the brine. Make sure the hock is submerged completely, place an upturned bowl on top if necessary so the cure can penetrate all over. Leave in the fridge for 3 days, turning daily. After 3 days remove what has now become a ham hock and rest on a plate in the fridge for 24 hours to dry before cold smoking if you intend to. As mentioned ham hock needs long slow cooking. Place in a deep saucepan with water and bring to the boil, simmer slowly for around 3 hours until the meat is falling of the bone. Halfway through cooking taste the stock. If it’s unpalatably salty, discard half and replace with more water, this will ensure that the ham isn’t too salty. If you can’t be bothered making a pie, add some vegetable to the pot for the last 30 minutes and serve simply with some creamy mash. 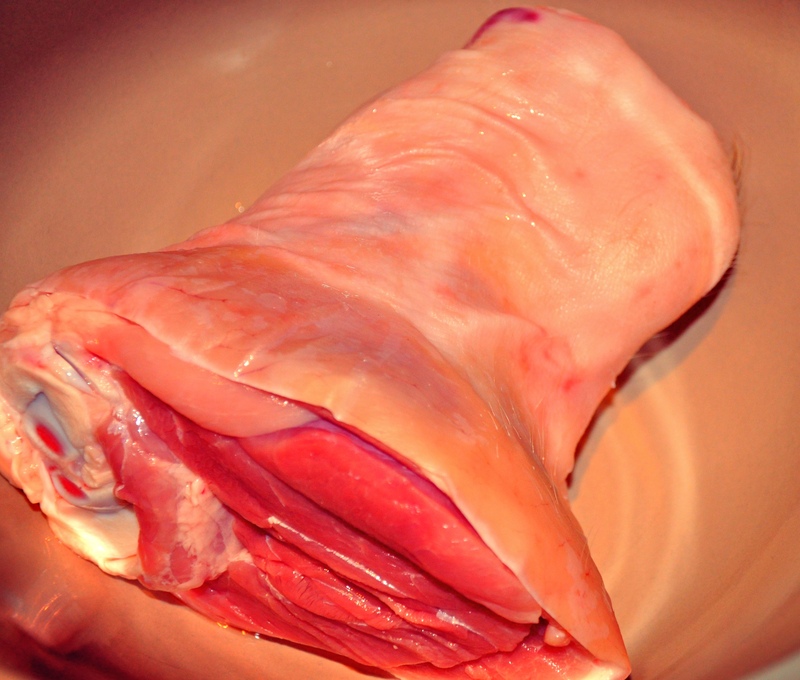 Once to hock is cooked and cooled pull the meat off the bone and discard the fat. While the hock is cooking make the pastry. 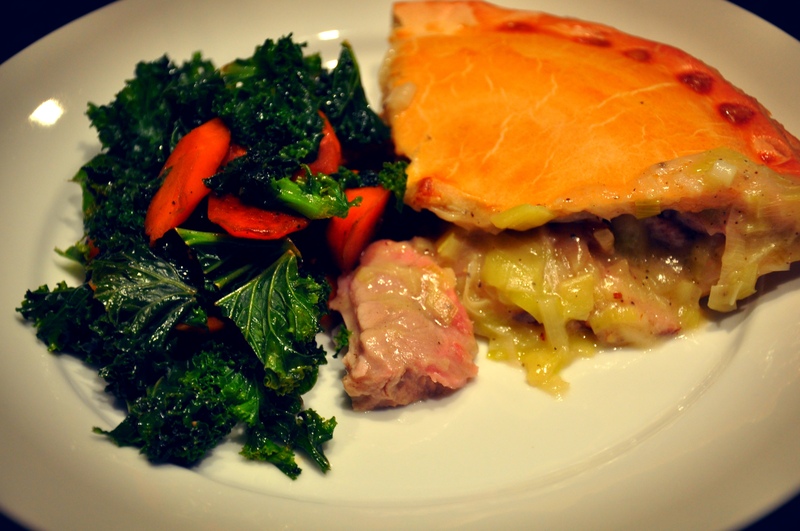 This pastry is not a short crust pastry, its more like the pastry you’d use for a cornish pasty more crispy than crumbly but works extremely well here. Sift the flour and salt into a mixing bowl and add the fats, rub in to form a breadcrumb-like texture before adding the water. Use a fork or spoon to bring the dough together before turning out onto a clean work surface and kneading as you would bread for 5-10 minutes. This is the key difference between this and a short crust pastry where kneading ruins the crumbly texture. This is because kneading develops the gluten in the flour and it becomes more elastic. This is what you want with this pastry. After 5-10 minutes of kneading the dough should be smooth and glossy, be careful not to overwork or it will become sticky and messy as the fat warms up. Leave to rest in the fridge for at least 30 minutes. While the pastry is resting make the pie filling. Sweat 3-4 leeks in a little butter for 10 minutes before adding 2 tablespoons of flour and some of the reserved cooking liquor from the ham hock. This will create a nice glossy mix which you can now add back the ham to. Season with black pepper, you will probably not need salt as the ham and the stock is salty. Do not add too much stock to the pie filling, too much liquid will make the pie soggy. You can serve it with gravy if it’s too dry. I know this sounds weird but Id say the consistency of thick custard is ideal. Now assemble the pie. 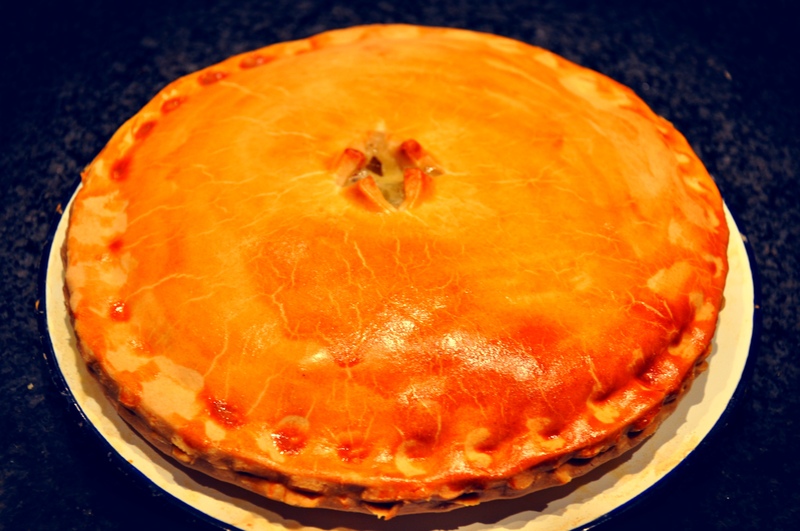 Roll out your rested dough to the thickness of a pound coin and line a pie dish or oven proof plate before spreading the filling on top and covering with another layer of pastry. Crimp the pastry to seal the two pastry layers together and enclose the filling. At this stage you can freeze the pie. If you have enough pastry and filling to make two, I suggest you do, and cook one another day. Pierce the centre of the pastry to allow steam to escape, glaze with egg to produce a lovely brown glossy finish and bake for 35-45 minutes at 180 degrees. Serve simply with seasonal vegetables, I steamed carrots and kale. This recipe does take a bit of time if you are curing your own ham hock. You could always buy a ham hock or substitute for any chunky diced ham and use a good chicken stock. Its well worth the effort though. As they say, ‘good things come to those that wait’.